Every so often you see something that makes you stop, scratch your head, and laugh like a fool. I couldn't stop thinking about just how South Florida this was. 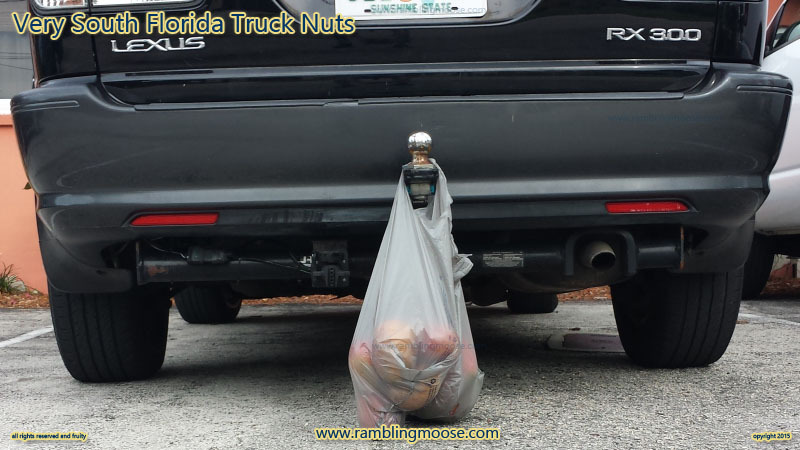 A bag of mangoes hanging off of a trailer hitch on the back of a Lexus SUV sitting behind a waterfront apartment in Wilton Manors, Florida. So lets deconstruct that. I will anyway since I'm still amused at the sight of it all. It was taken in Wilton Manors, Florida just two miles from the beach. Pretty South Florida to me. Add to it that we're just about as central a location as you can possibly get. Travel time to Downtown Fort Lauderdale can be as little as 10 minutes, and we're by time about the same distance from West Palm Beach and Miami's respective downtowns. It's a little further to West Palm Beach but the roads are better heading North. Now, that whole Truck Nuts thing? It's a more redneck affectation - you generally don't see them hanging off of anything that isn't a pickup truck. I have seen them on a random Jeep, but normally it's an F150 pickup truck that has been through a few miles. A Beater. Someone who wants to shock you. Why a shock? Trucks generally don't come from Factory Equipped with a pair of day glow testicles hanging off the back so it's a bit of a sartorial mistake. Doesn't harm anyone, but it is a bit weird. My truck has bigger balls than you do or something equally Juvenile Mindset. For the record, my Jeep's Trailer Hitch doesn't have anything on it at the moment. This was a Lexus. Mind you it wasn't exactly a new one, but it was a Lexus SUV. So the idea of putting truck nuts on the back of a Lexus is a show stopper to begin with. Now, it really isn't a pair of truck nuts. It's a bag of about a dozen ripe mangoes. Folks who have mango trees generally are trying to find a place to put all the fruit at this time of year. A mature tree can easily put out about 100 pounds of fruit. A large child or a small woman's worth of fruit. It all ripens within a month of itself. You have to keep after your trees because a mango falling from 32 feet in 1 second is going to hit you in the head at about 27 miles per hour. 2 pounds hitting you at 27 MPH/43 KPH could be fatal. So pick them before they fall. The ones you don't get will roll out into the street and get mashed into the pavement or eaten by ants in short order. Now what are you going to do with 100 pounds of fruit? You can only make so much Mango Jam, Mango Bread, Mango Chutney, Chunked Mango, Caribbean Honey Spiced Chicken with Mango, and my own breakfast today, Mango Lassi. Make too much and your eyes will roll back into your head in a sugar shock and you'll swear off them for the rest of the year. I made 12 jars of Mango Jam and canned 9 of them. If a storm knocks out power, we will have plenty of sweet Mango Jam to trade with the neighbors to have with their Peanut Butter sandwiches. When September comes, My Dear Sister will probably get one. That's how you get rid of your extras. Some folks will sell a "Homer Bucket" full of Mangoes online. The going price is around $10. But that's not what happened here. A neighbor of this truck owner was gifted a bag of them and they were left to amuse me as I walked past. In front of the little apartment house, next to the river that surrounds the Island City of Wilton Manors, deep in the heart of South Florida.